There are conventions popping up for plenty of hobbies and fascinations. 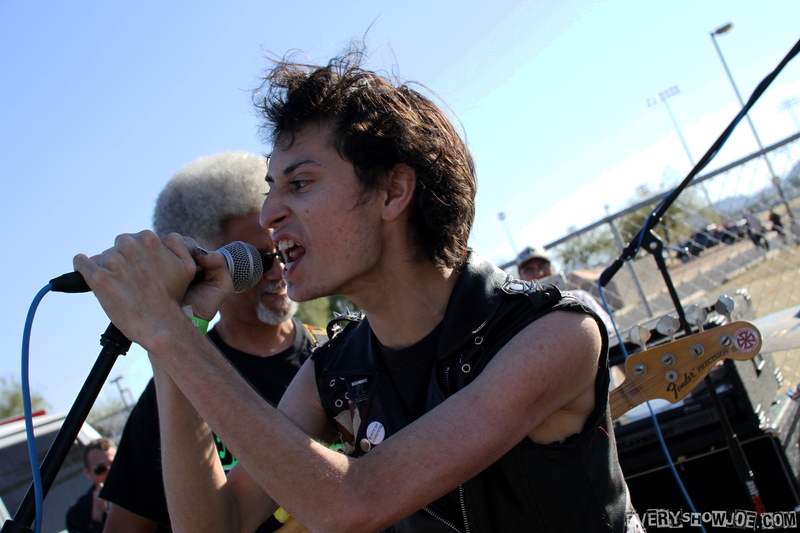 The most popularized model is the comic and pop culture convention. 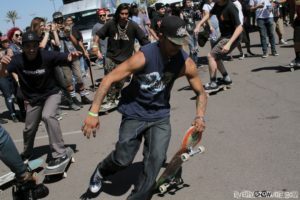 Furthermore, it is inspiring fans of other hobbies to organize conventions and gatherings for their favorite hobbies. 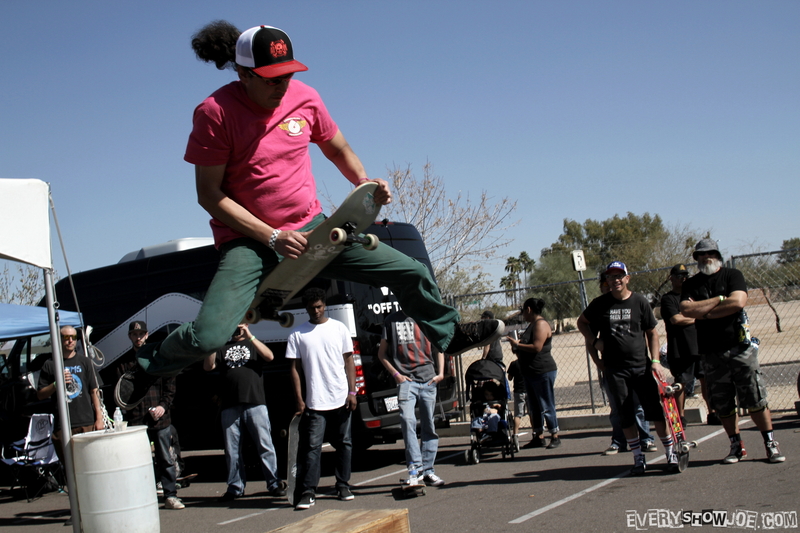 One of the newer ones to pop up is the Phoenix Skatercon. 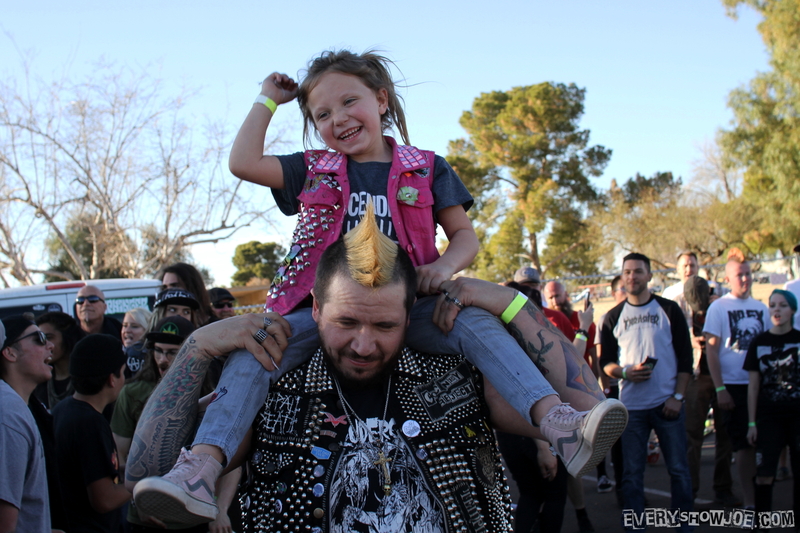 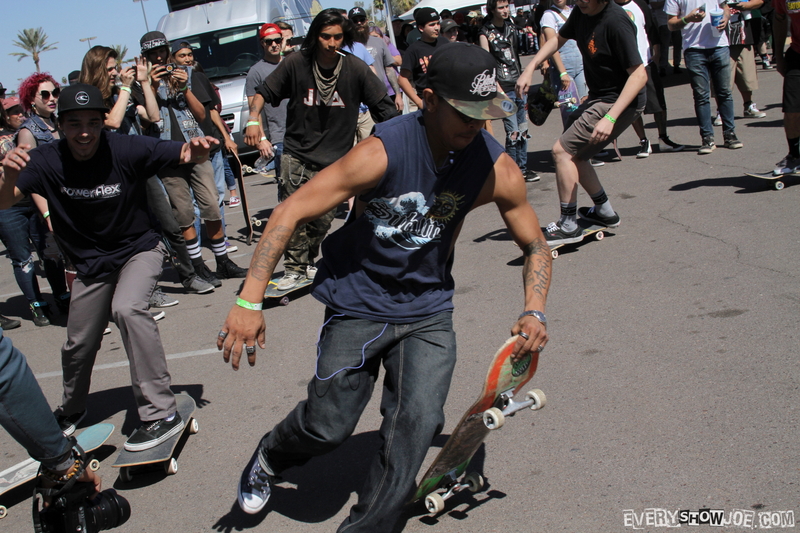 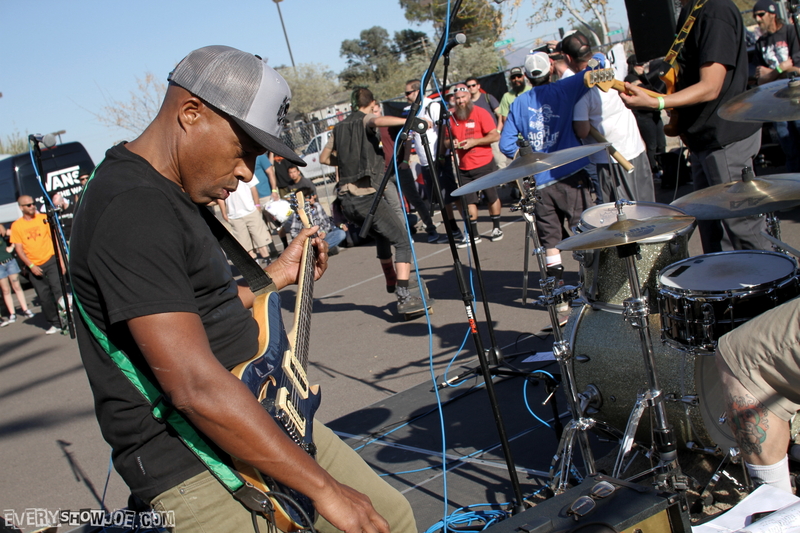 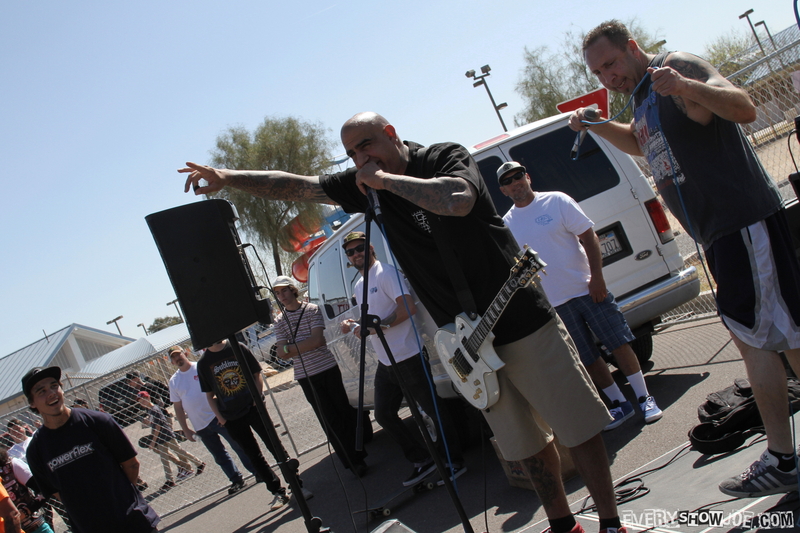 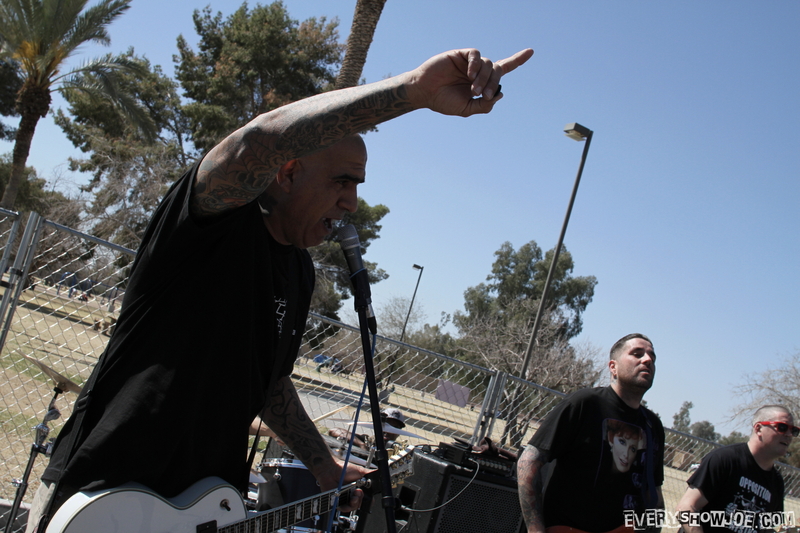 A convention built around the skater culture, from skills to punk rock. The music brought excellent acts from Since We Were Kids to D.I. However, this whole convention is one that exceeded my expectations. 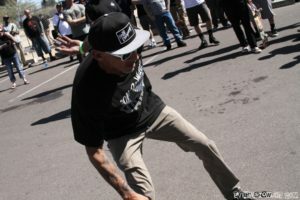 In its third year, this was my first adventure out to the Skatercon. 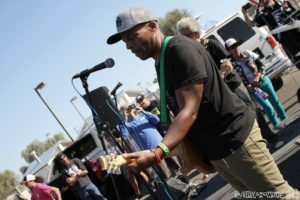 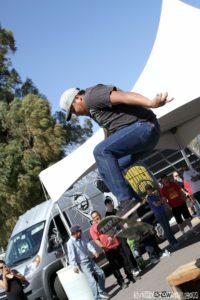 Right from entering, you are greeted by booths of skateboard vendors to old school skaters like Christian Hosoi and Steve Caballero. 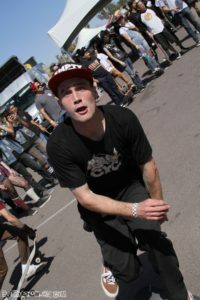 The other thoughtful thing is you have grind rails and ramps down the middle of this walkway for the skaters. 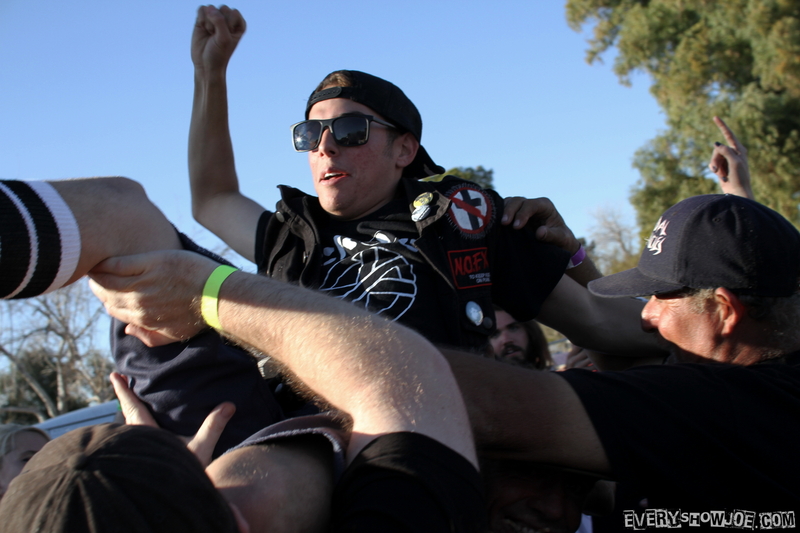 At the end of this, pointing toward the stage between bands is a ramp too. 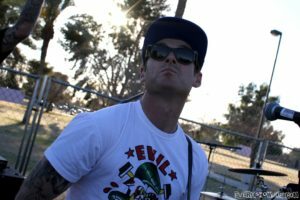 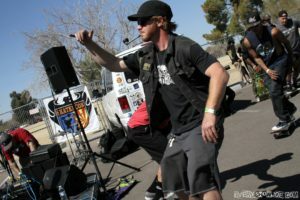 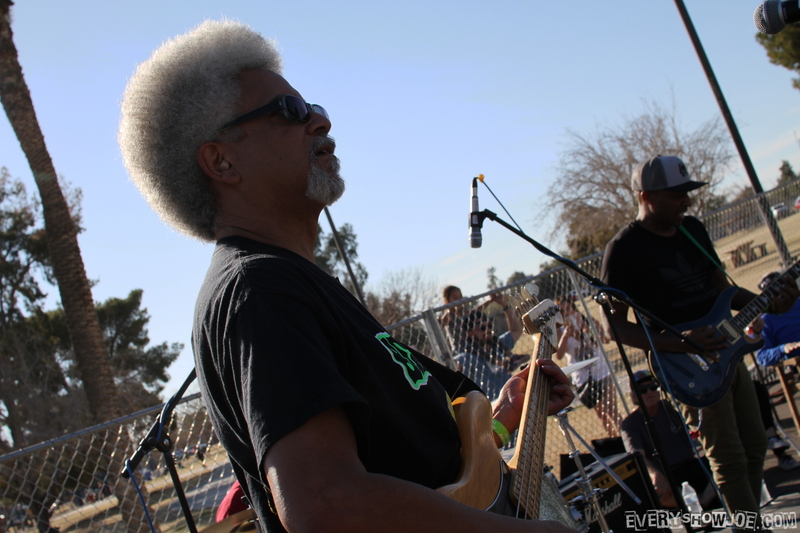 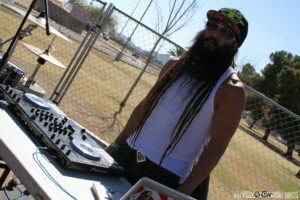 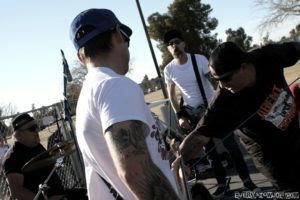 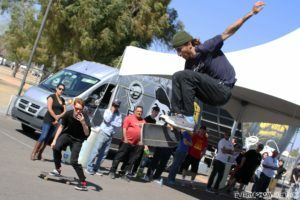 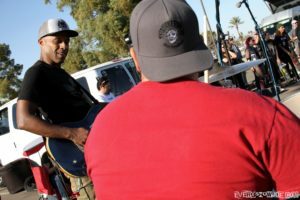 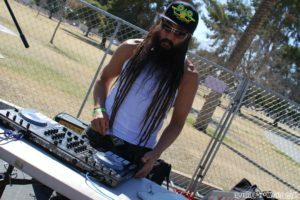 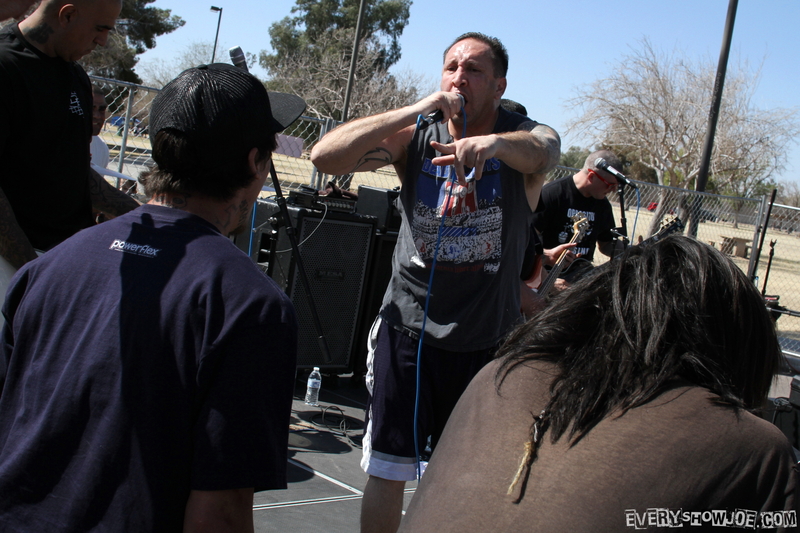 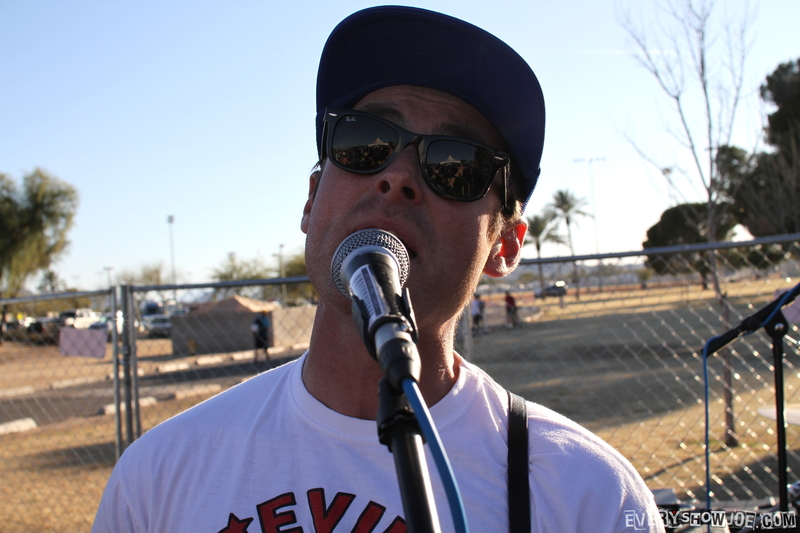 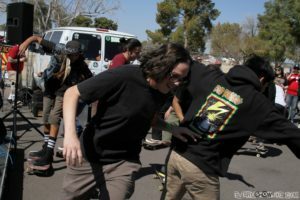 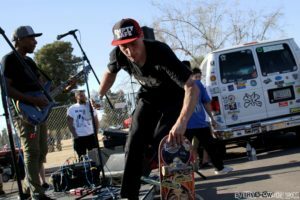 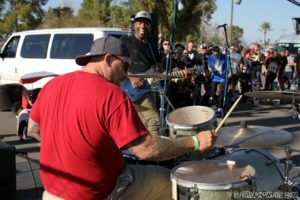 With it setup using the Paradise Valley Skate Park, they hold skills tournaments for all ages. 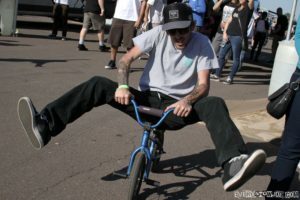 This is a fantastic way to celebrate and show off the skills of those that came out. Plus there is the awesome line up of musicians, a few being skaters themselves. 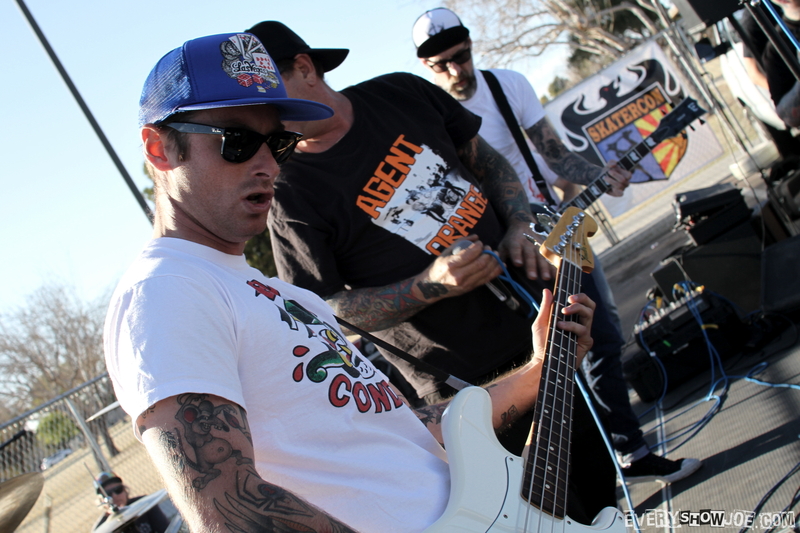 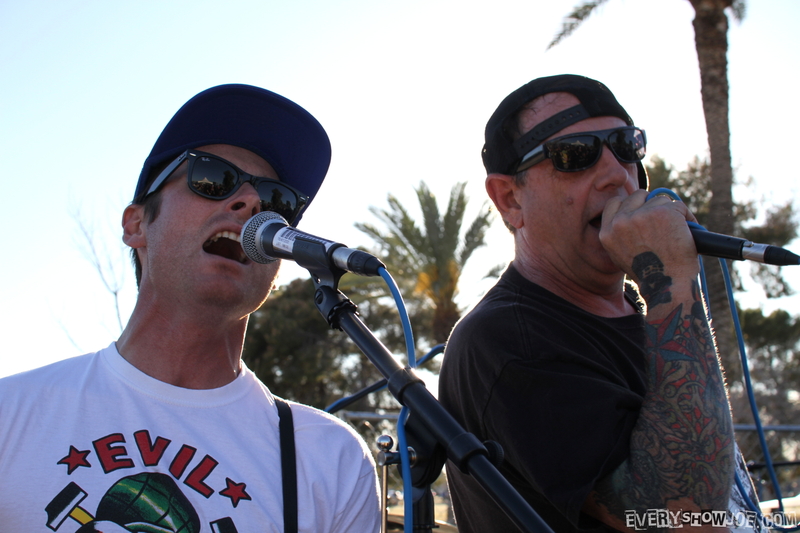 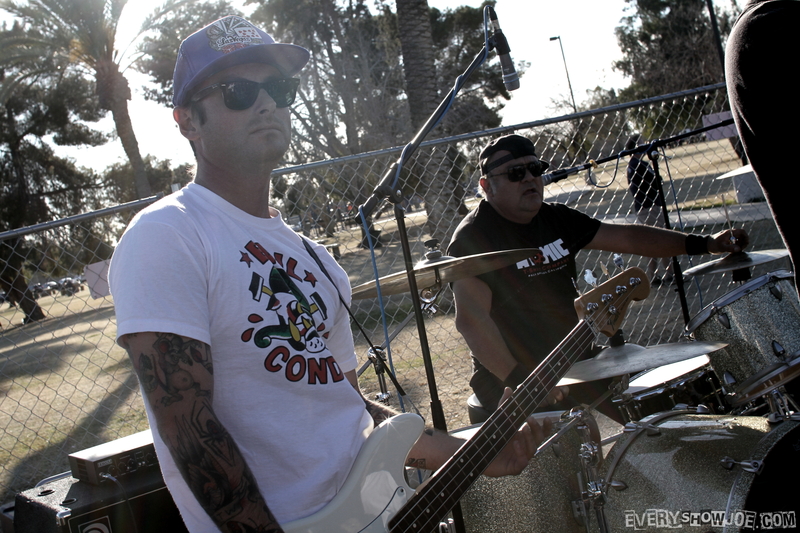 Up first were the guys in Since We Were Kids, immediately bringing the skate punk to Skatercon. 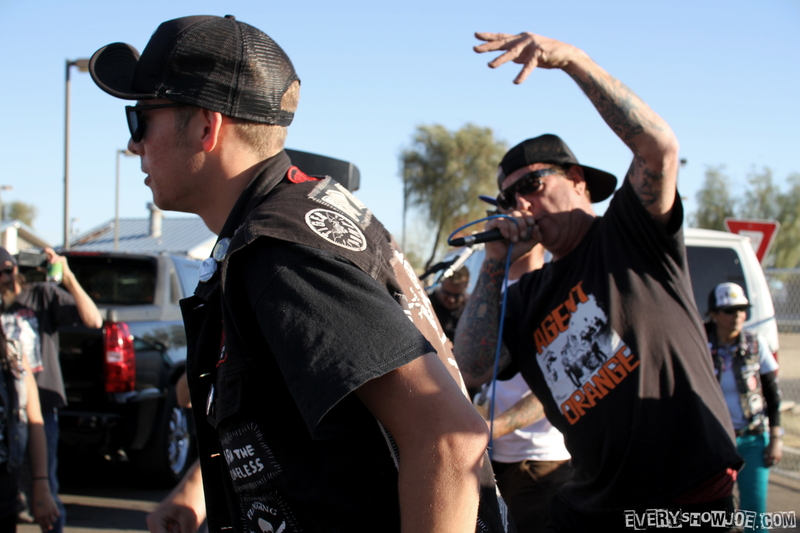 This was some fast paced, old fashion punk. 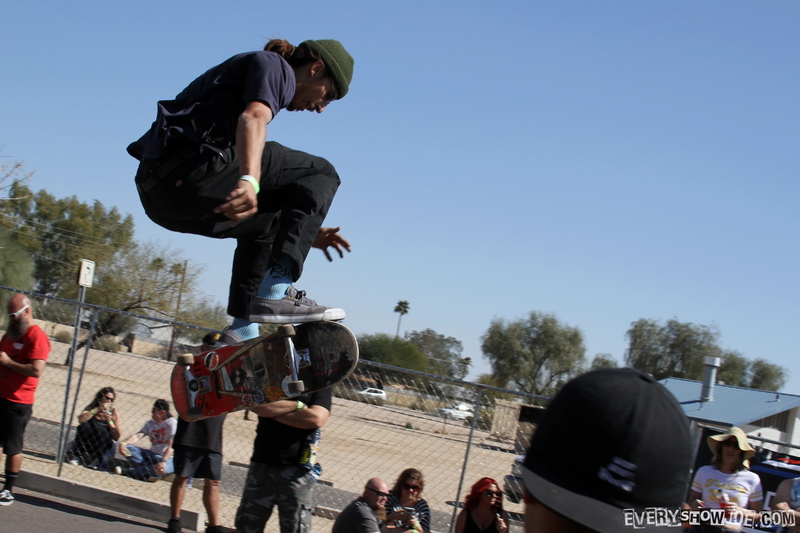 Their energy got skateboards moving immediately with the first skater pit of the day. 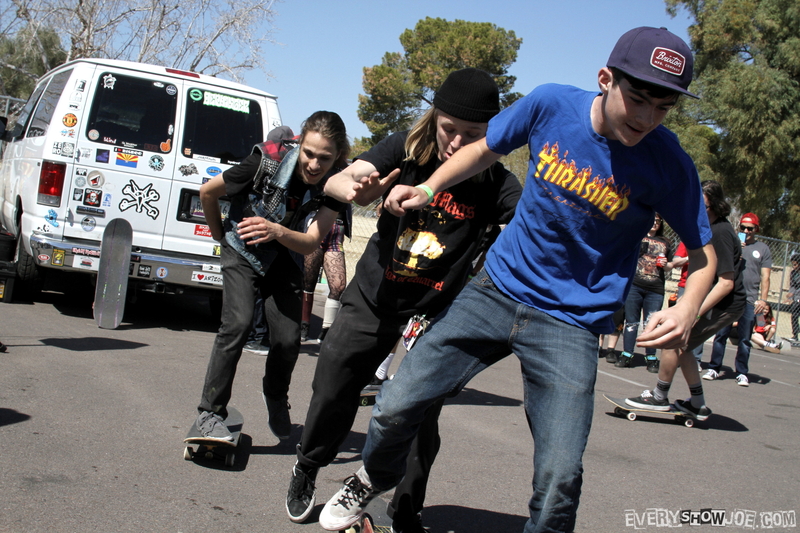 As skaters themselves they were about getting people on their boards during the set. 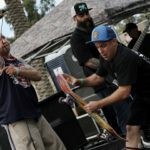 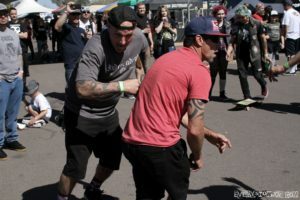 A normal show has your average attendee attempt to stage dive, but here we had guys trying to do grinds and tricks off the stage. Clearly Since We Were Kids showing they knew their audience this day. 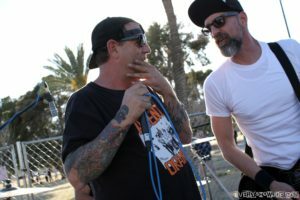 They brought the awesome set to do it too. 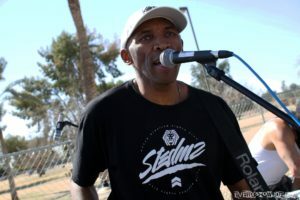 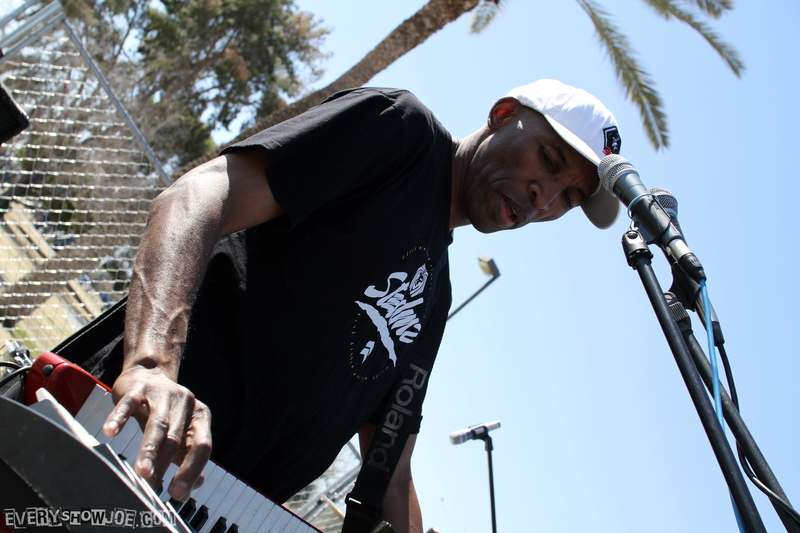 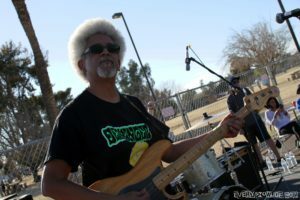 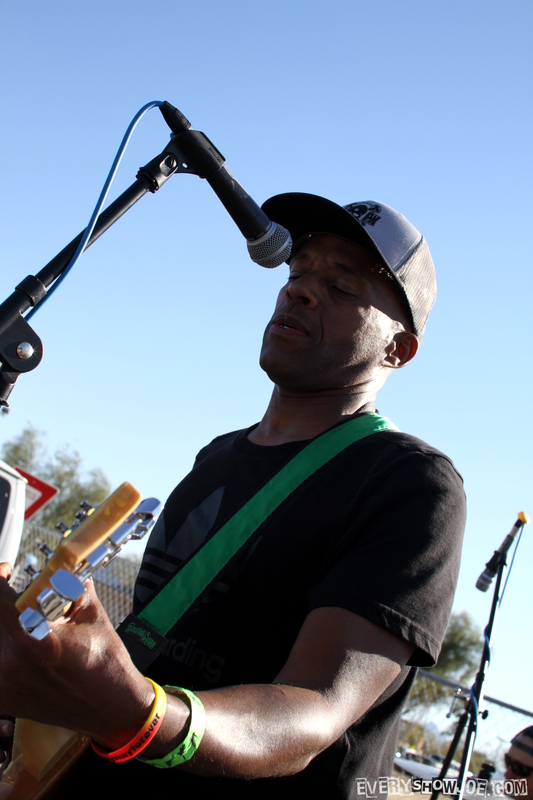 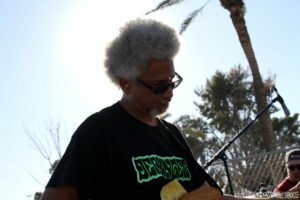 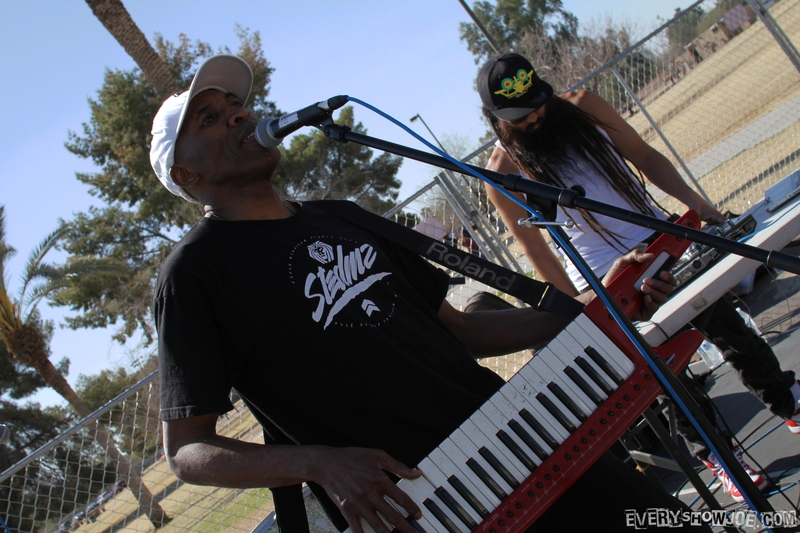 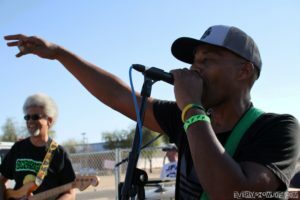 Then it was a well-known skater, Steve Steadham, bringing out his reggae style to the stage. Even here, we found the skaters ready to watch and move. 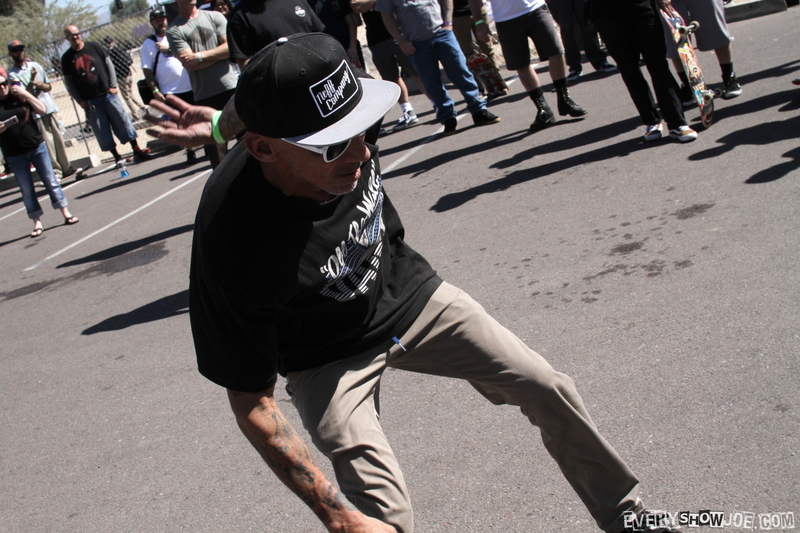 There was more grooving to the rhythm than moshing though. 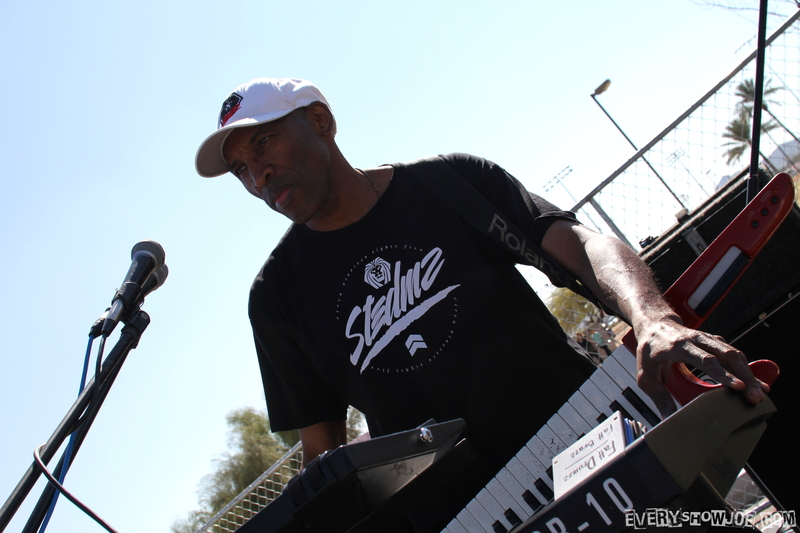 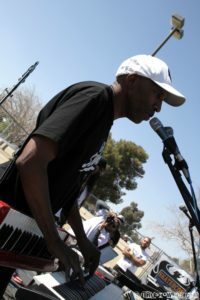 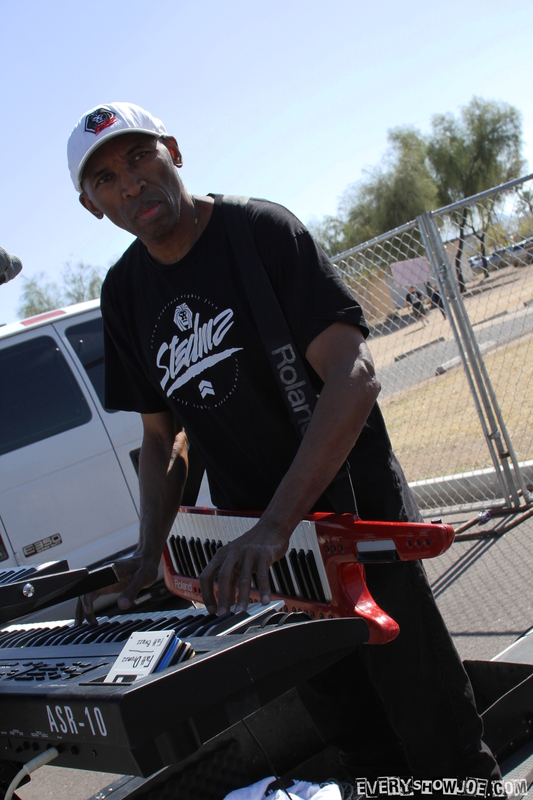 Steve sticking to keys and keytar while he had someone who ran a soundboard and mix tables. Altogether this combined to putting together a great reggae composition. 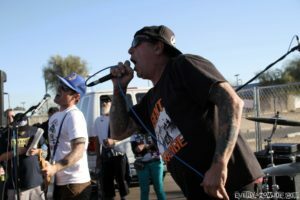 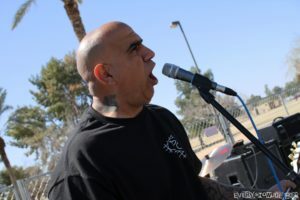 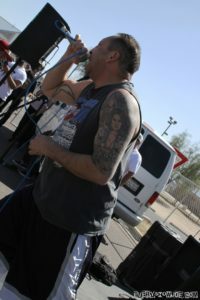 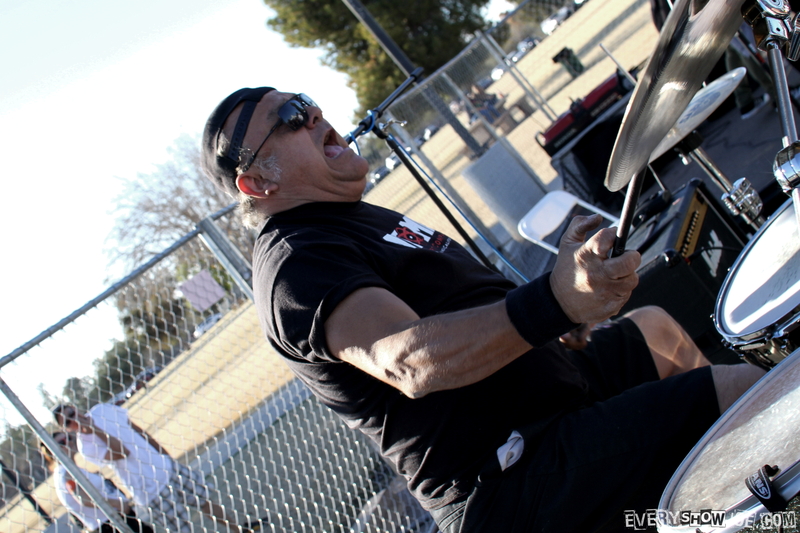 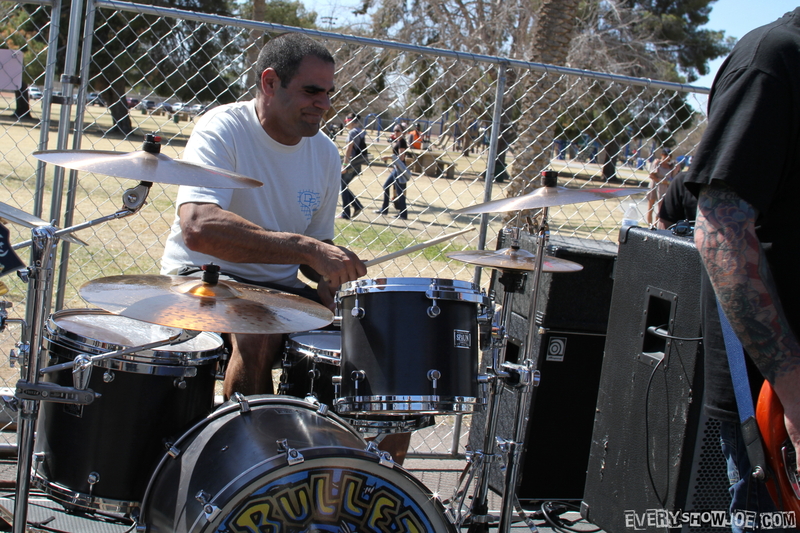 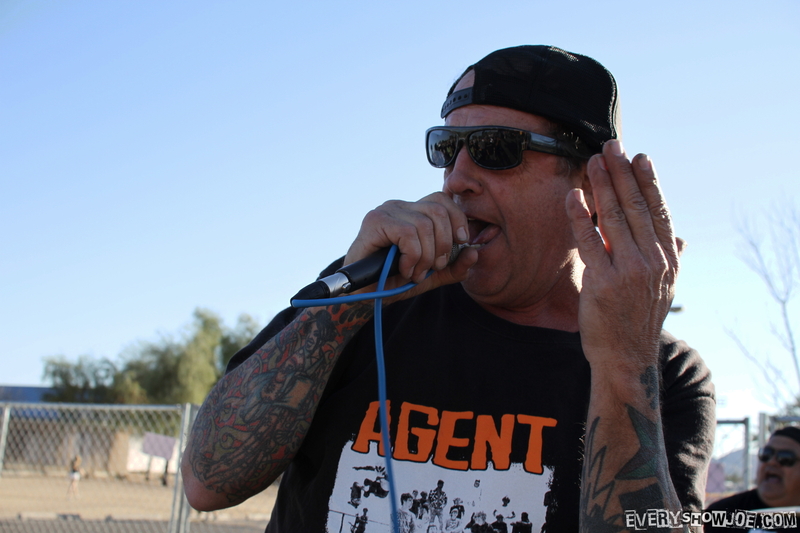 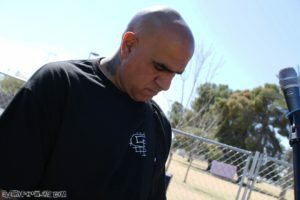 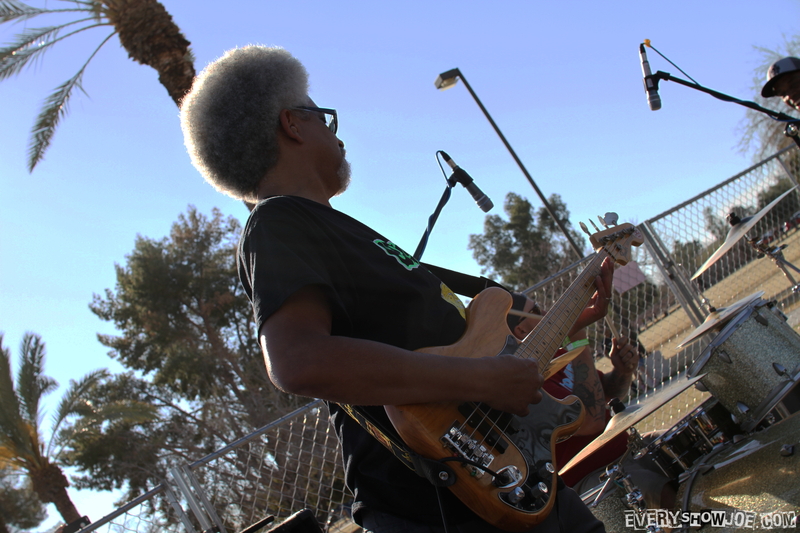 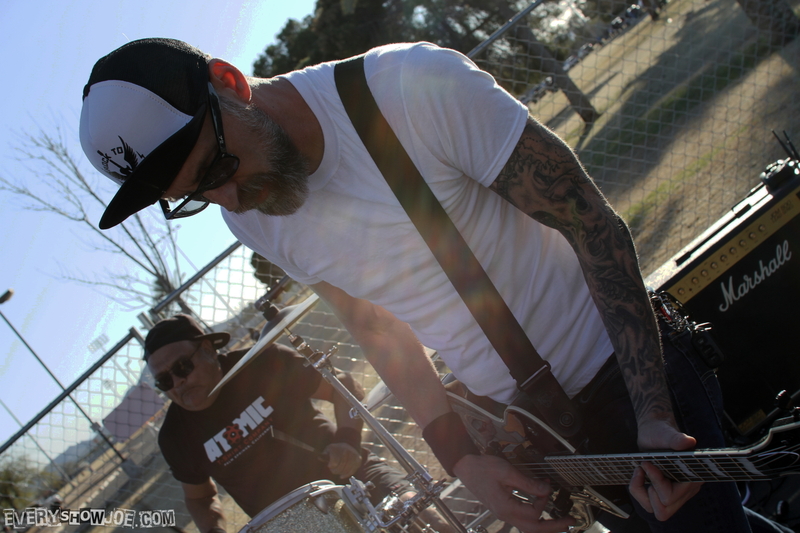 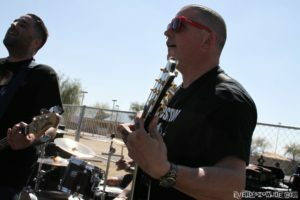 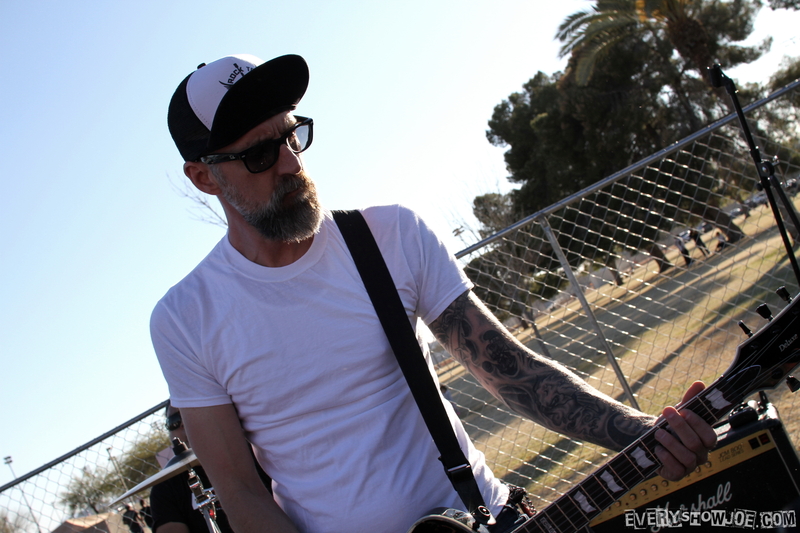 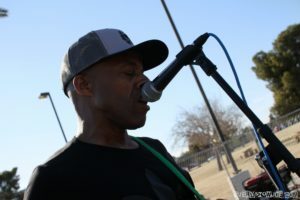 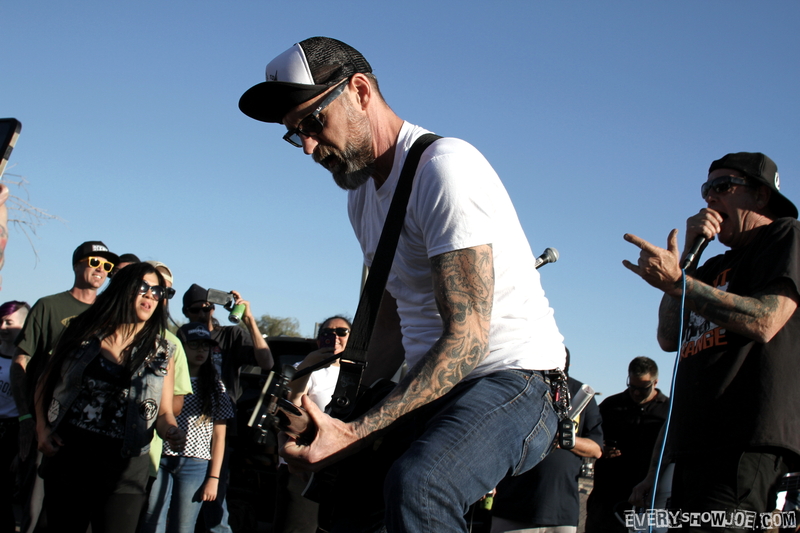 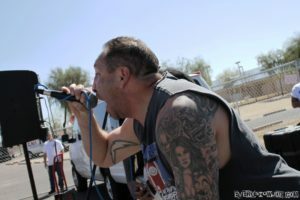 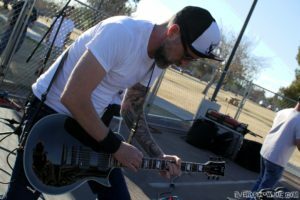 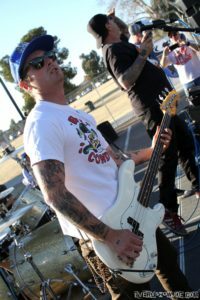 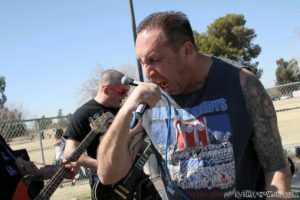 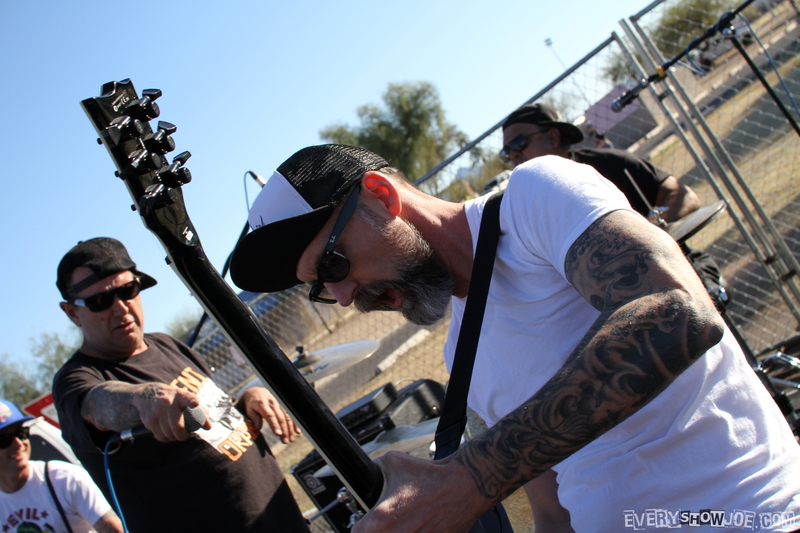 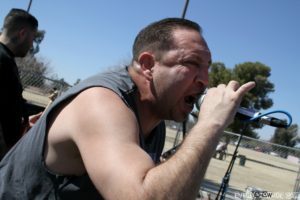 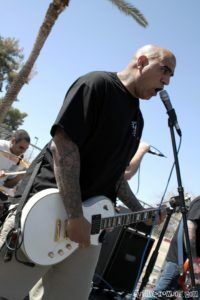 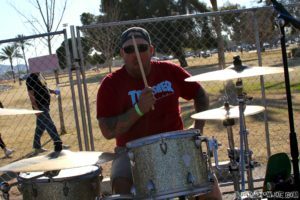 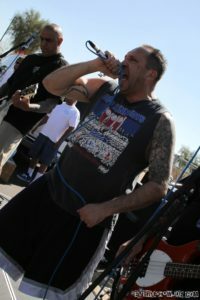 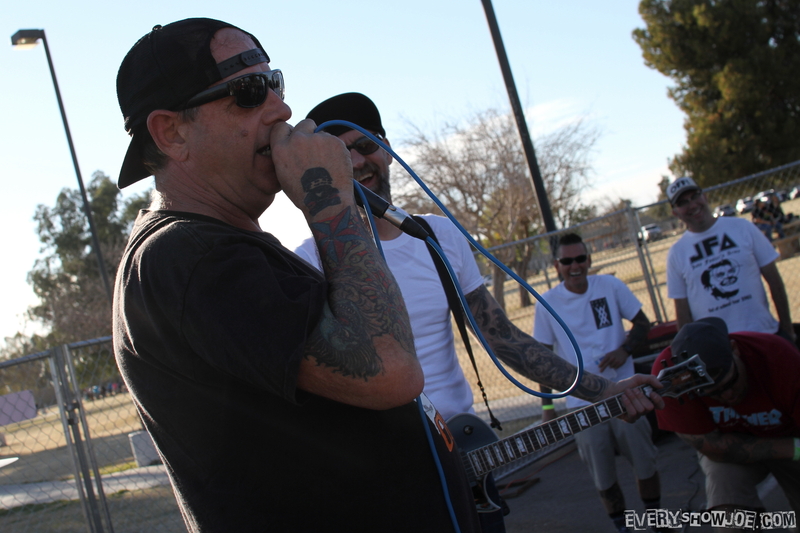 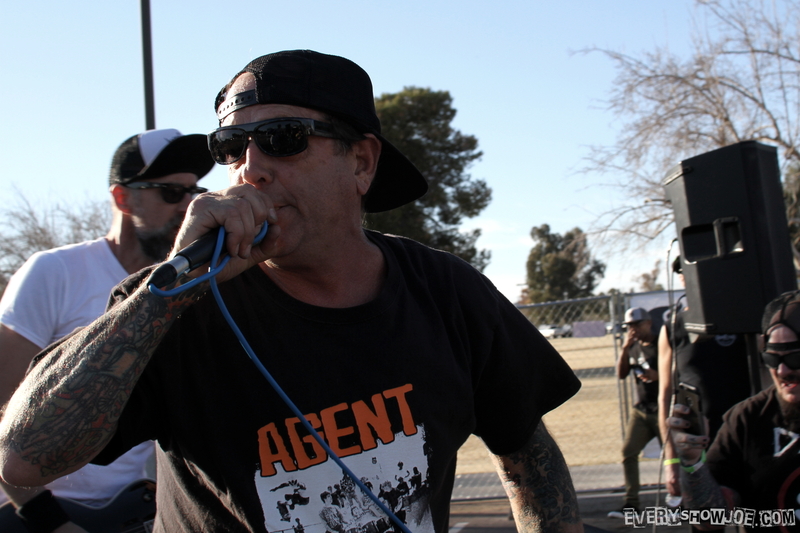 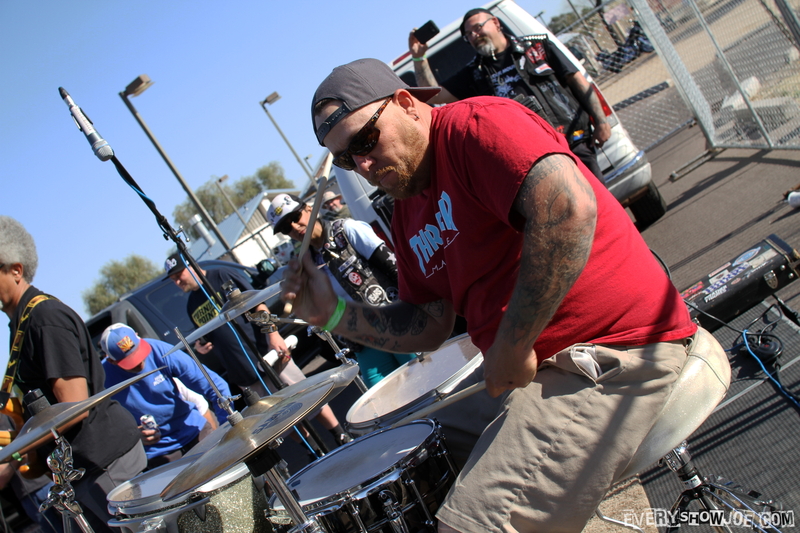 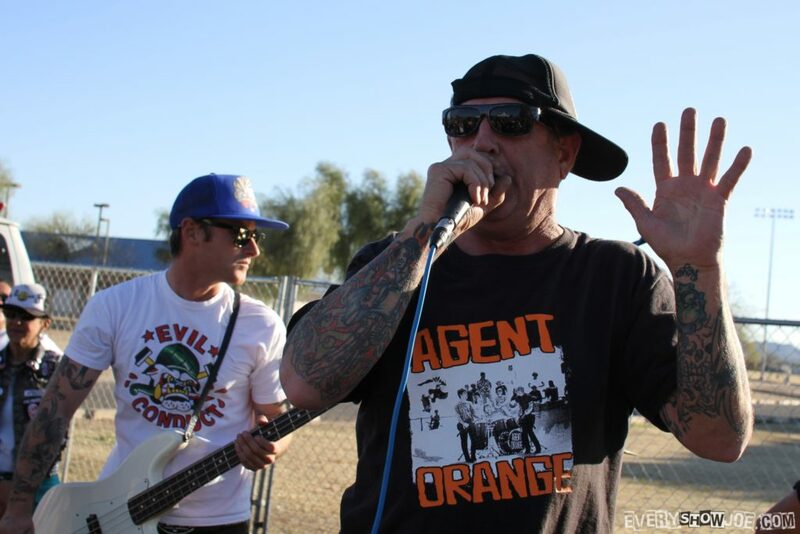 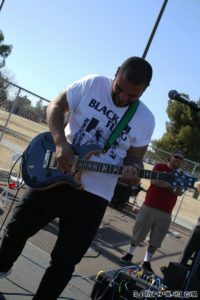 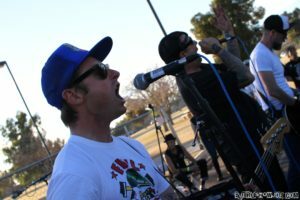 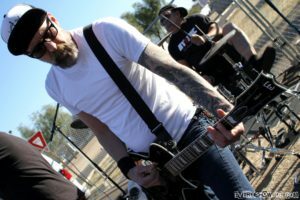 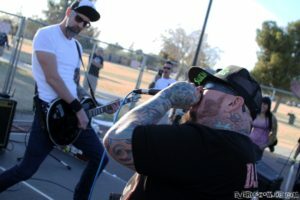 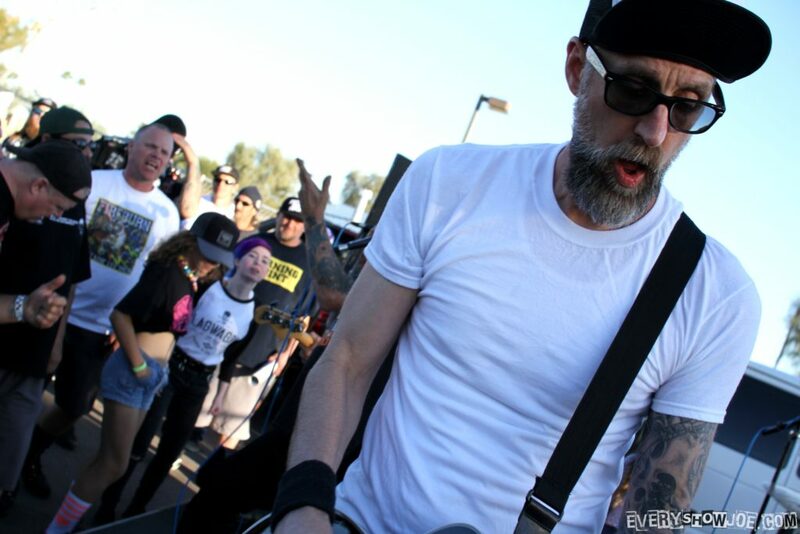 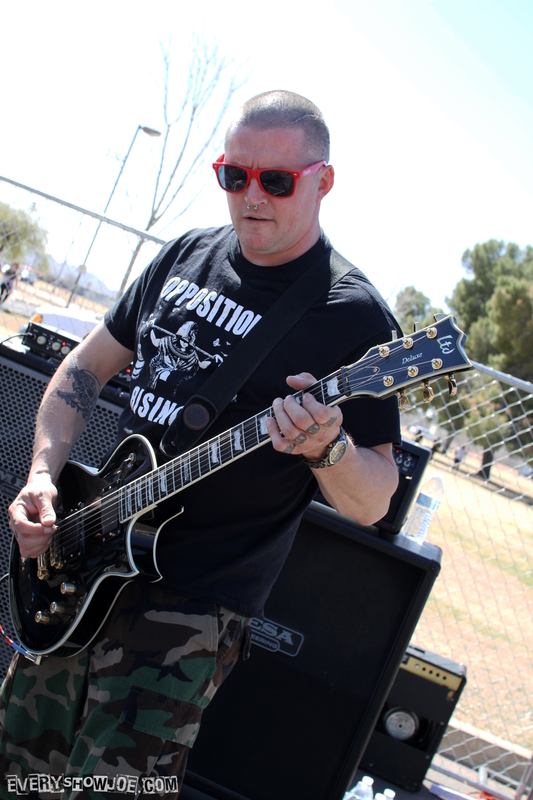 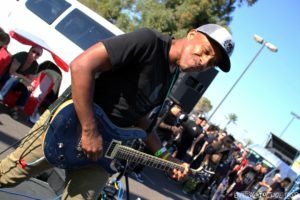 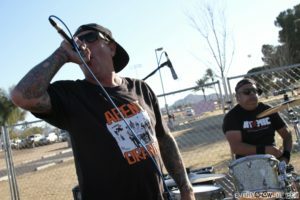 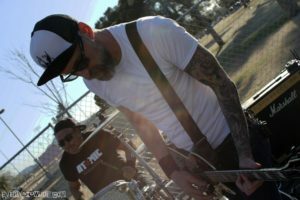 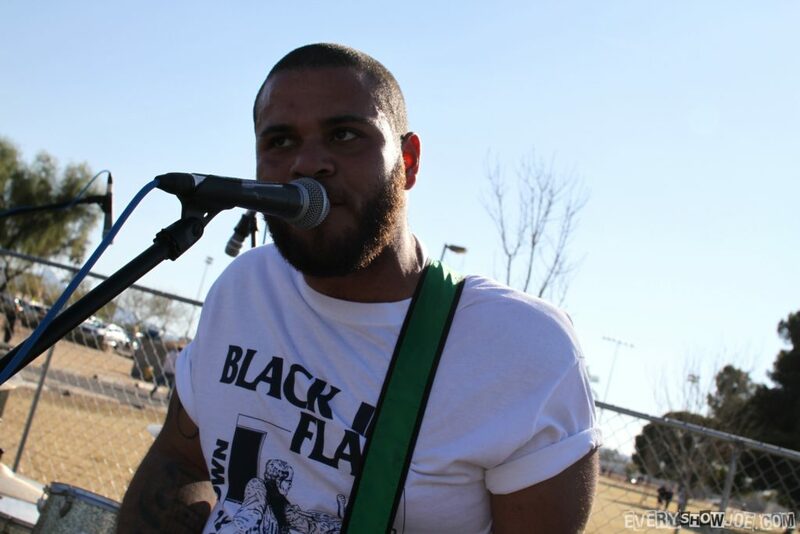 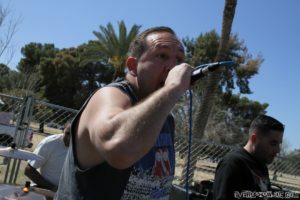 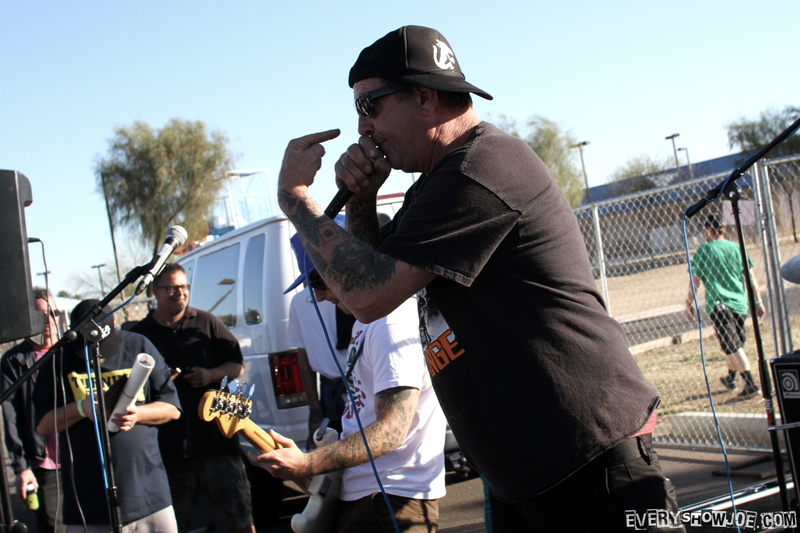 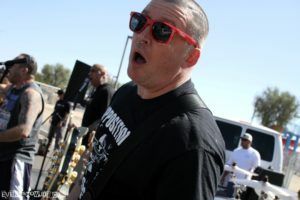 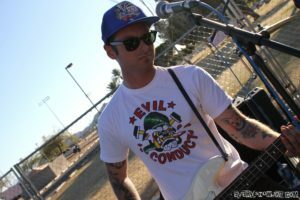 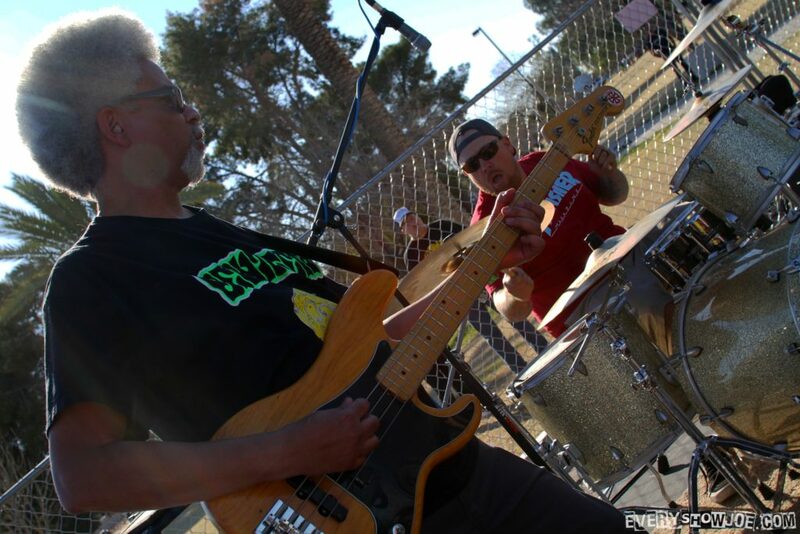 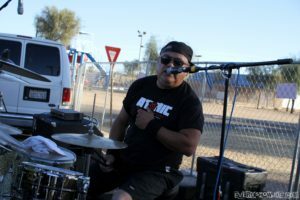 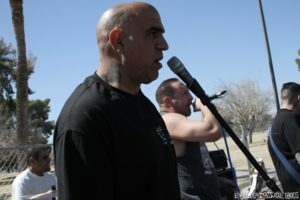 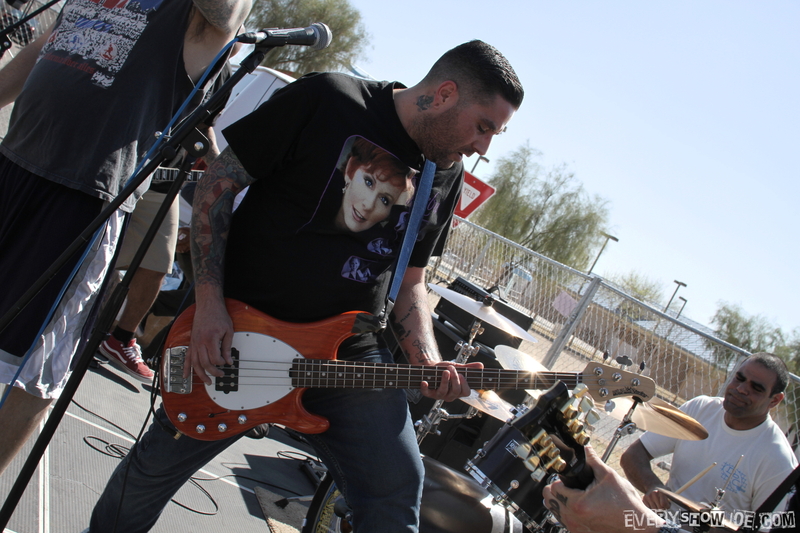 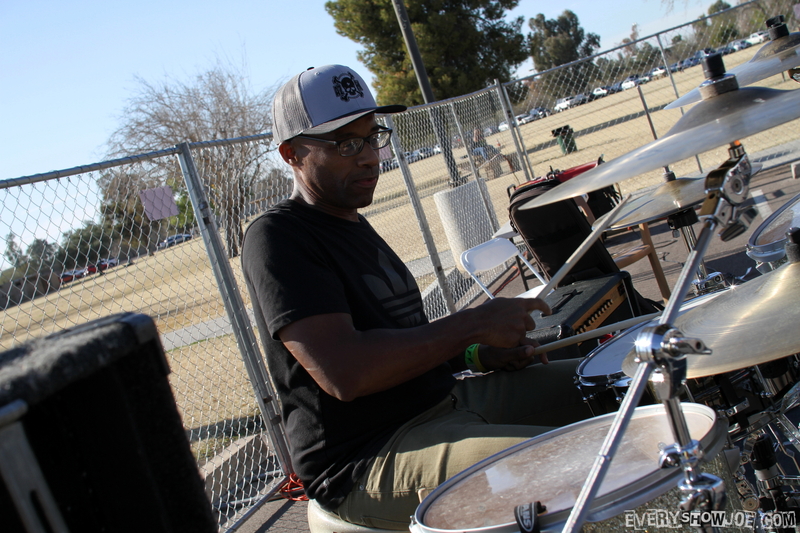 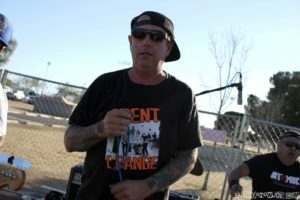 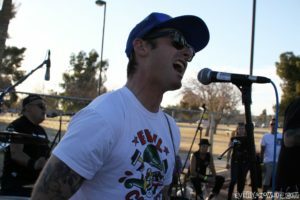 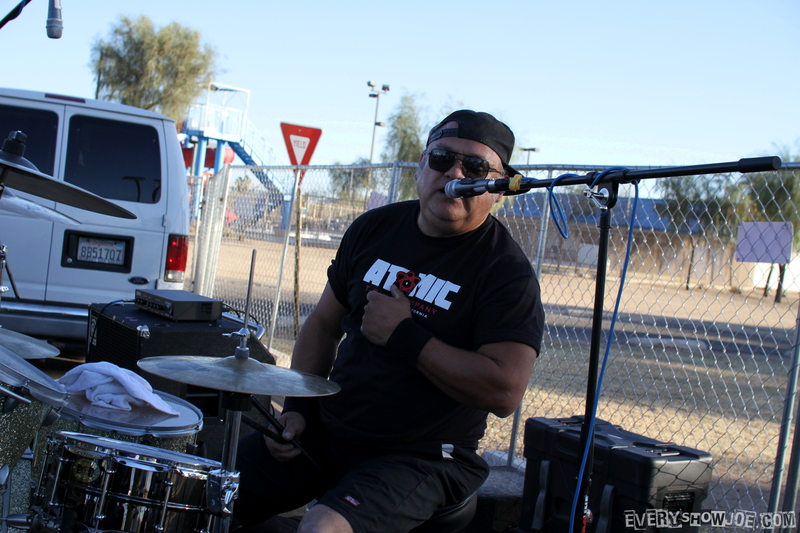 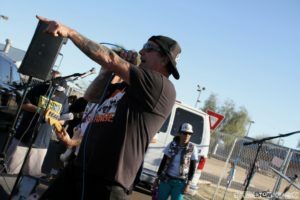 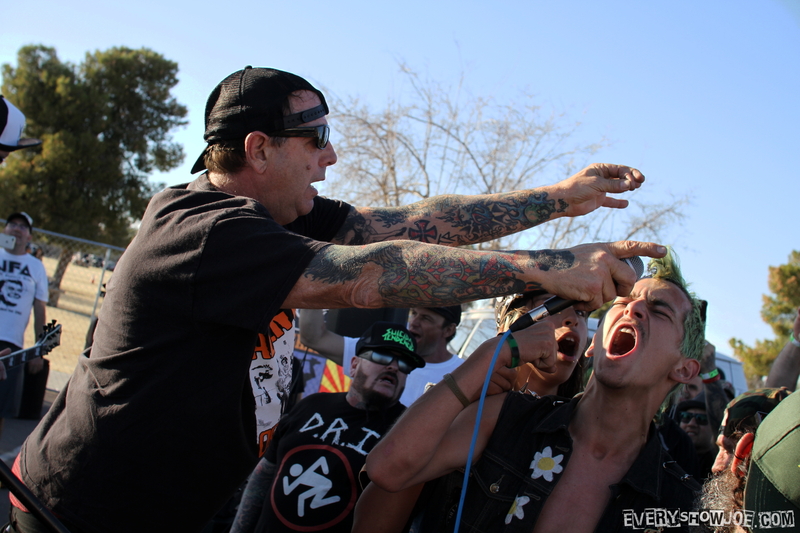 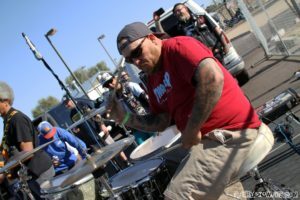 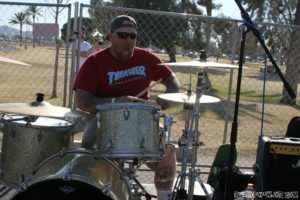 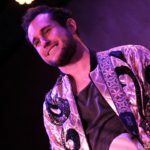 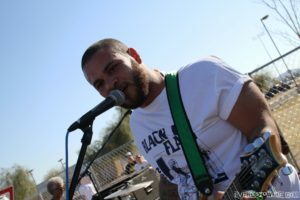 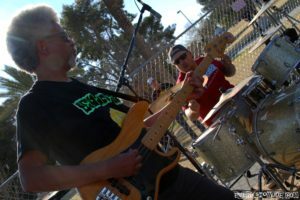 While the standout music act from a concentrated amount of punk rock, Steve had a great performance out there. 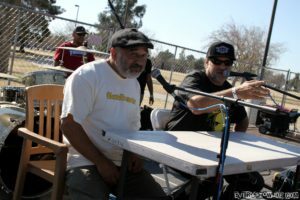 Following that was a little interview break, setting up another skateboarding legend, Steve Caballero, on the stage for a little Q&A. 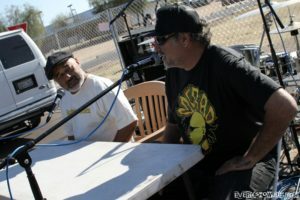 He answered questions on his life. 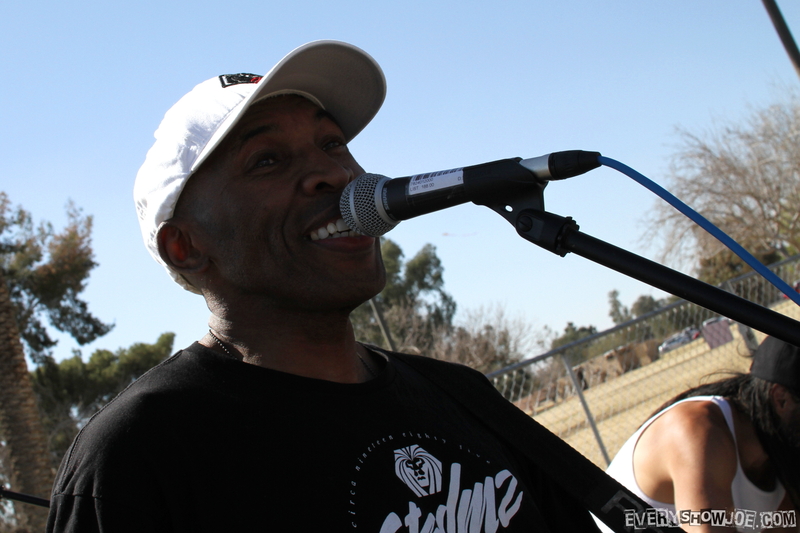 Steve talked about how grateful he was for the opportunities his life has granted him with. This included him talking about his punk band the Faction a little. 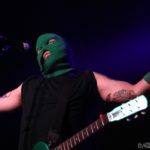 This part made me wish I could be in two places at once, and go watch them perform at Punk Rock Bowling with Zero Boys. 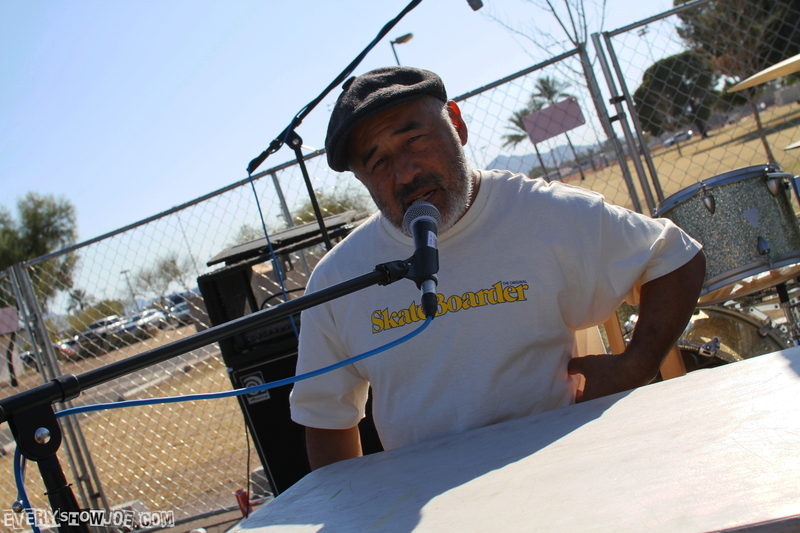 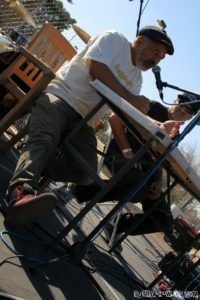 It was a great interview with Steve Caballero. 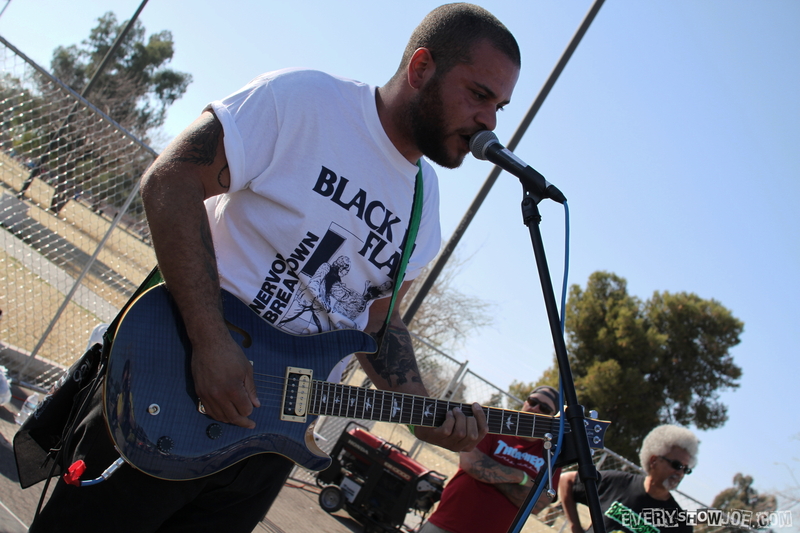 Then there was McRad bringing us more of that skate punk. 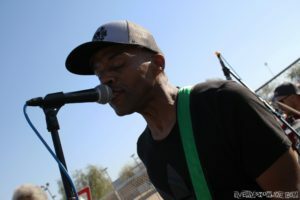 At first, it was Chuck Treece starting out on drums while a couple songs were led by a vocalist and guitarist that escapes my mind at the time of writing this. He was excellent up there and smiles for a lot of it. Then the lineup swapped around. 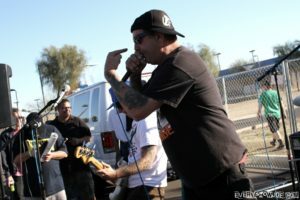 First, just the people comprising this band made McRad an amazing proposition for my ears. We had Chuck moving to guitar and vocals, Mike, from the Father Figures and JFA, on bass, and Nick, from Dephinger, on drums. The talent of these guys clearly showed as they played through the set. Second, they were all having a noticeable blast up there. 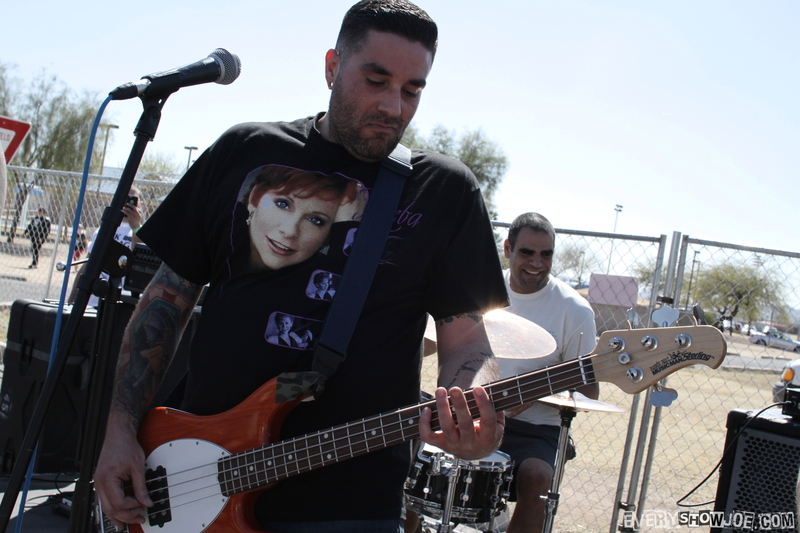 This continued a theme of the entire day’s musical acts. The crowd was back doing the circle pit and romping around. 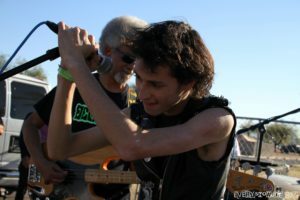 At one point they invited one of the kids up to sing a cover, who got right into it. McRad was a band that could have been headlining and I would have called the day fantastic. Of course, that wasn’t the last, there was D.I. 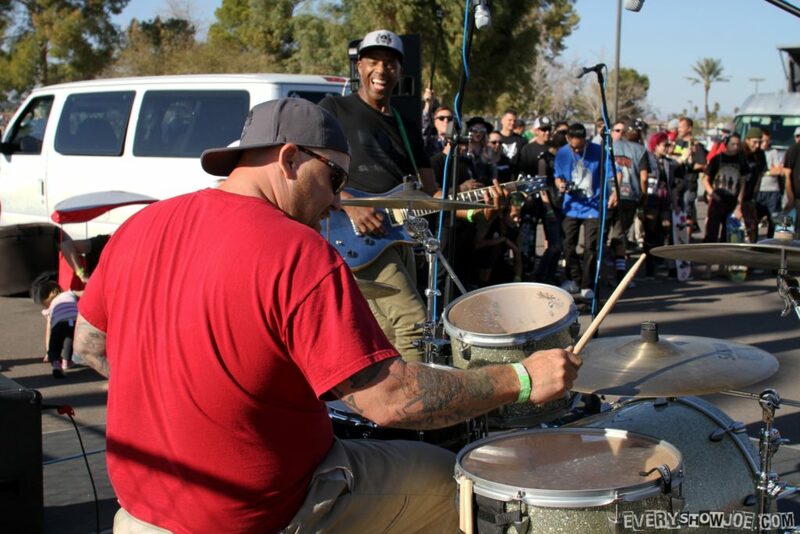 headlining. Think of it like adding a second exclamation point to the music lineup. 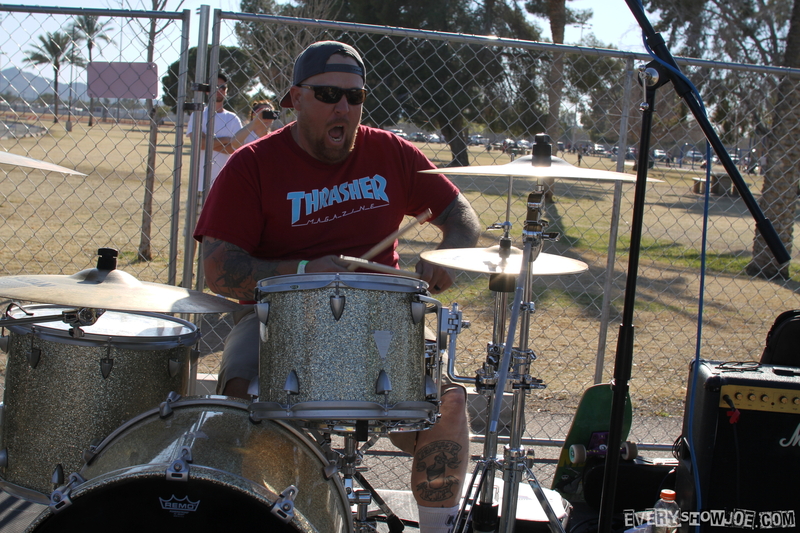 Casey alone entertained me through the set. 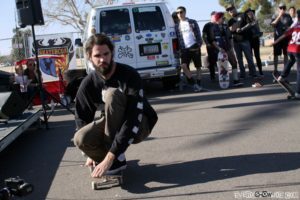 He had them move the ramp back to the middle for people to use as they played. 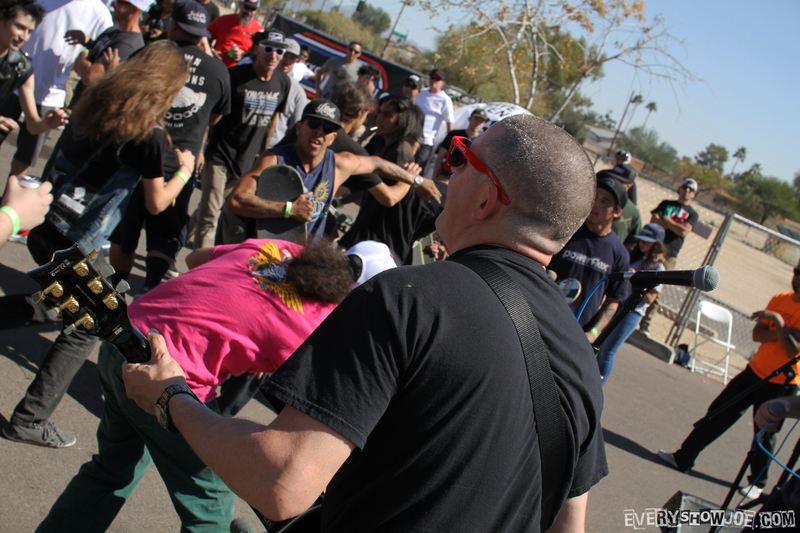 Then between songs was making up violent commentary about how the tricks landed. At one point Joe lost his drum stick and just kept hammering on the kit with his hands until the end of the song. The lineup was everyone but Eddie, who was on tour with the Dickies at the time. 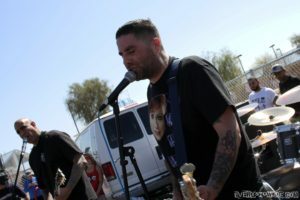 It didn’t matter, because in his place Trevor was just as animated and that matched everyone’s personality in this band. 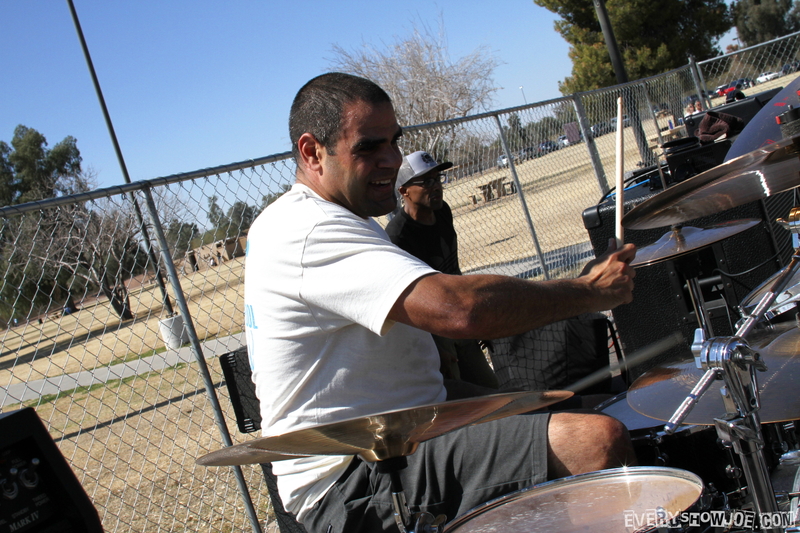 Every moment of this set had funny and entertaining attributes. It is the charm that makes D.I. 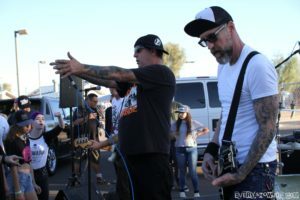 a blast every time I’ve seen them perform. That made for the perfect cap to the event that is Phoenix Skatercon. This is an event that was amazing, and I want to make it a annual occurrence for myself every year now.